It looks like this... Except in 3D of course. So, I built it, and it works nicely. Here's how you can source and build your own. 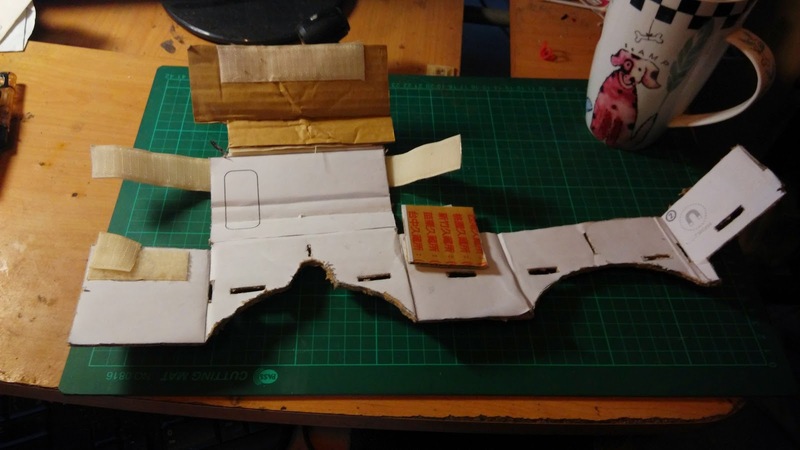 Everyone hopefully has cardboard and a printer,. But lenses, NFC tags and magnets are a different matter. Fortunately, you only really need one of these, lenses. And despite the ones they used being sold out on Amazon, you can still get what you need. Google says that they used 2.5 cm diameter lenses with a 45 mm focal length. Put differently, that's an inch across lens with about a 7x magnification. That's more than most magnifying glasses (usually about 3x). You could build one with them, but it might be like looking down a tunnel. 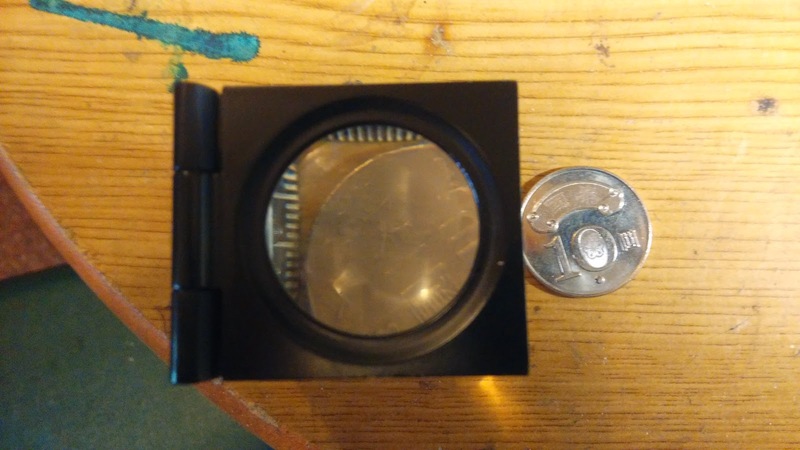 What worked for me was using loupes, AKA the little magnifiers that people use to check money and jewely and biology stuff. They are generally both roughly the right size and magnification. I ended up using 6x jeweler's loupes, but ideally you would go to 7x. 8x would likely be great too. 5x will definitely be acceptable, if slightly tunnel-like. This cost me about 7$ - but I already had one. You can likely get yours cheaper. I was fortunate in that it was possible to pop the lenses right out of mine. Of course, I only figured this out after sawing metal for 5 minutes. Mine were a 3.0 cm diameter - not a problem. Even 4.0 cm should work. Another possibility would be the magnifying glasses that you can buy. I did see 5x ones, but passed them up - might make some parts easier. Google says copper tape, but this is cheaper and works fine. Although the software works with any modern Android phone, it was designed for the Nexus 5. Many people reported problems with the magnetic sensor. That's because it's not in the same place on all phones. Having a slightly unusual phone, I ended up using a strip of cardboard with aluminum foil tape to do the same job. That said, the magnets aren't too hard to set up or find. Just be aware that you might need to move the sensor around a bit to find the correct location. I'd print out the magnet holder separately, build it as an independent piece, and test until you've found the best location. I guess it's cute to have it turn on automatically, but the IM360 app is cool too. Not worth the trouble. This does require some thought. Ideally you want a stiff, thin cardboard, like they use for game boxes. 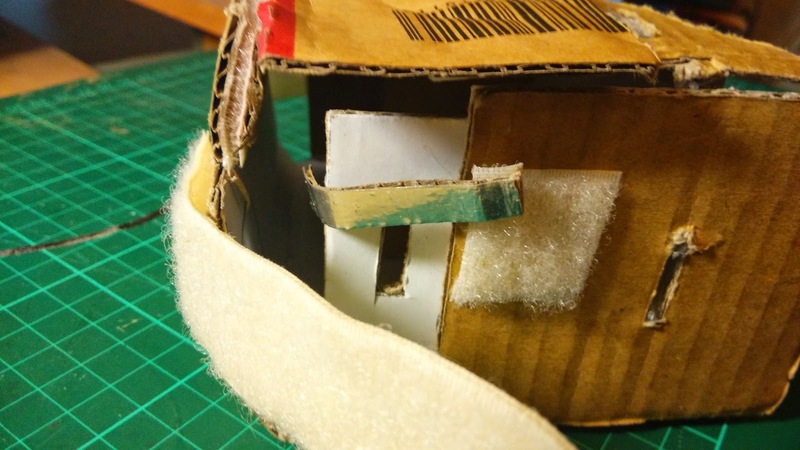 I, on the other hand, used ordinary box corrugated cardboard. This was a poor decision that has led to me turning on the glue gun. The thinner and stiffer and flatter the better. Matteboard would be quite nice if you have it lying around. I used a ton of this stuff, partly because I have tons of it. You should too, it's super handy. You could, however, do without. The most important thing to remember is that if you are not using the same lenses they are, your focal length will be different. That means you'll need to adjust the distance from the lenses to the screen of your phone. I, of course did not do that, and have thus ended up hacking and adding bits of cardboard to make the correct length. 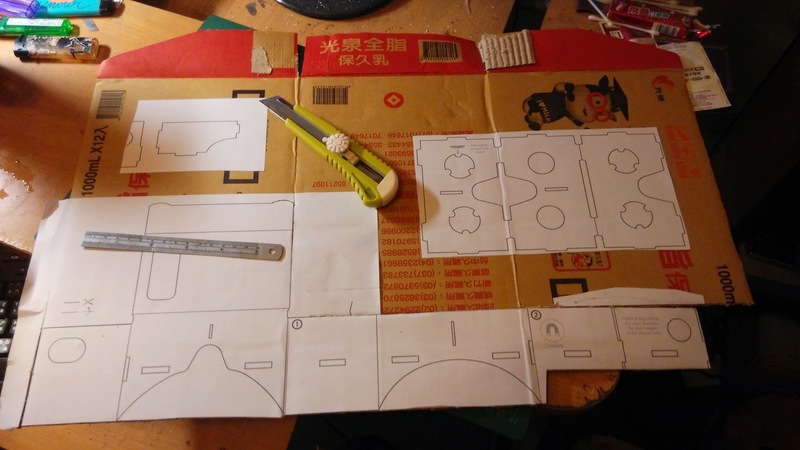 In truth this wasn't very hard, but it hurts me to think of the time I spent carefully slicing off bits of cardboard I could have used where they were. The lens holder is in the right place. What you need to adjust is where the phone is held. You do that by not cutting the top parts (away from your face) until you know the right focal distance for your lenses. This is simple enough. I used spray glue because I had some around (DIY board games), but any glue is fine. 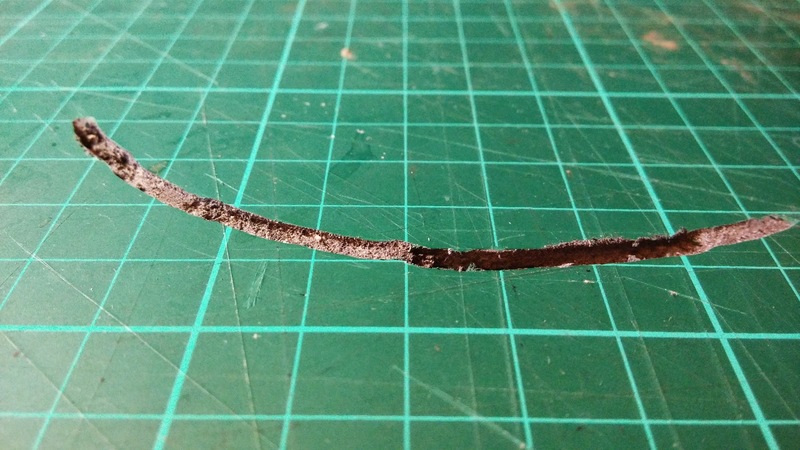 Did you know that self-healing cutting mats don't heal from router cuts? This is slow and painful. I tried the shortcut of using a router bit on a dremel, which worked but leads to a ton of dust and a very soft, fuzzy edge. You are not going to get good slots this way. Mind you, you could just do it outdoors, skip the slots and hot-glue everything together anyways (which I ended up doing in the end). It's a bit imprecise, though, and the dust is likely to be bad for your router. Most of it was straightedge and a box cutter, except for the curved bits touching my face. I ended up changing a few things. I abandoned the magnet part, and so the second folding part is unnecessary. The view divider is not crucial, and you can use it just fine even if it's too short, so cut that out as-is. 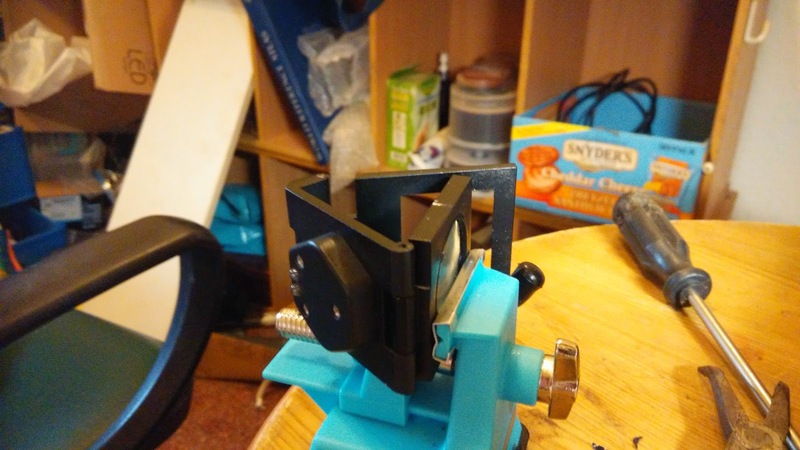 Adjust the size of the lens holder holes to match your lenses. Don't use their hole for the camera, since yours is surely going to be in a different place. And last but not least, leave extra height on the top of the main piece. I needed 2cm extra for my 6x lens, 5x will need even more. Where the plans call for a magnet, I used a bit of foil tape on cardboard. One end of the tape goes somewhere on the left side of the screen, near the middle/top. The other end goes somewhere you can touch it. 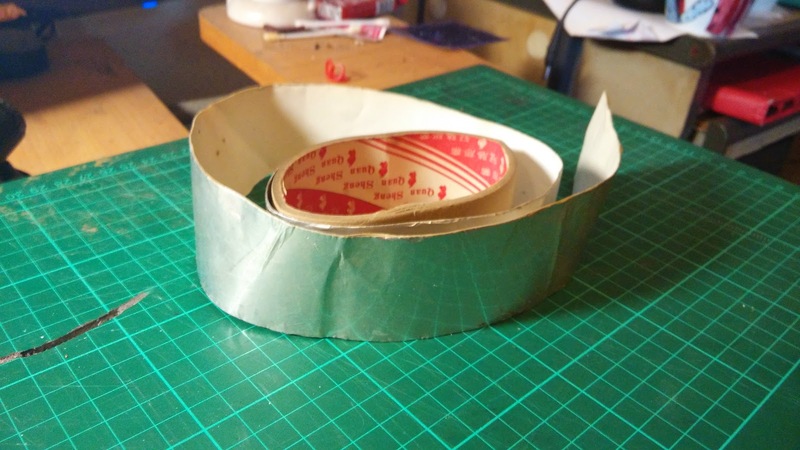 I used a bit of velcro tape to attach it, so I could adjust its position easily if needed. 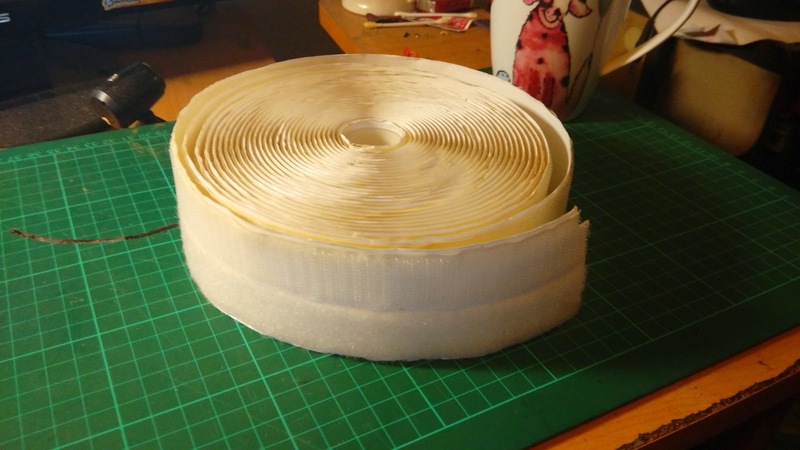 Don't make the tape too big. If you do this your finger's influence on the capacitance is small, and the touches won't be registered easily. Make it nice and slim. First, assemble the lens part. Since my lenses were slightly bigger, I ended up sticking them between the layers of the corrugated cardboard, which worked nicely. 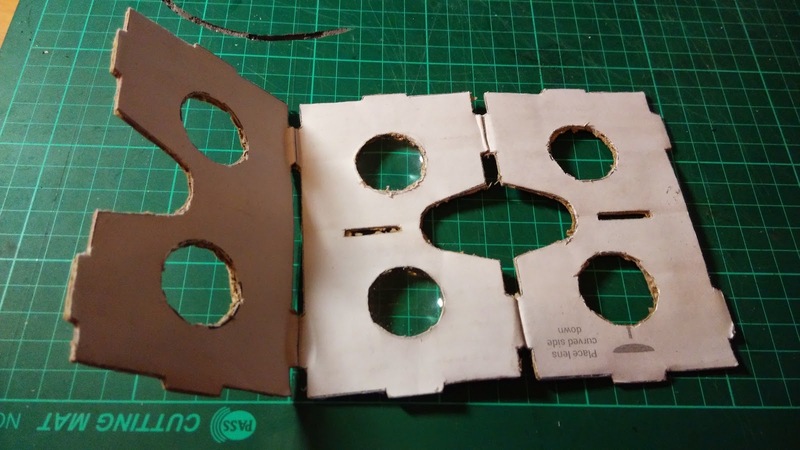 If you do this you should still keep all 3 bits of cardboard though, to add stiffness to the whole assembly. It's important to get the lenses nicely centered and on a flat plane. Fold all the bits carefully, except for the back part. I used a ruler to squish the folding lines. The bits of brown cardboard are pieces I added to make the distance from the lens to the phone correct. Put in the lens assembly and divider. You might want to use a bit of tape to hold things in place. 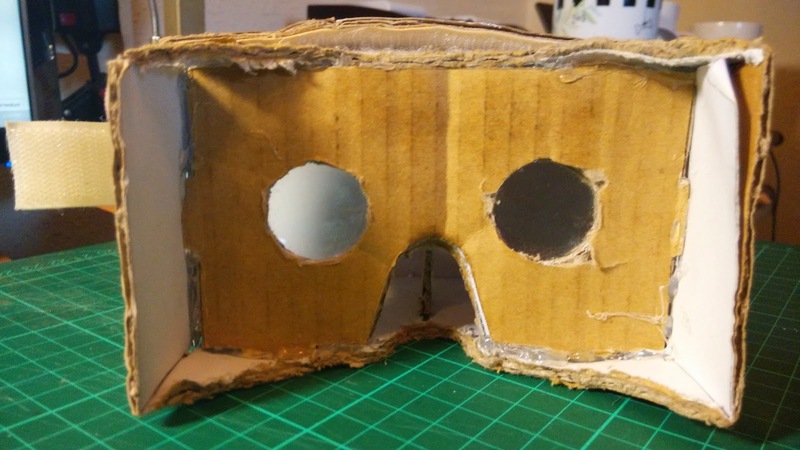 Turn on the Google Cardboard app, tap on the left side after the video plays, and grab a pencil. Turn on an app that works when pointed straight down, such as the Earth app. Fold out the sides of the box (I guess you'll have to slice the corners of the box). Move the box up and down over the the phone until the image is crisp and 3D. Fold and mark the correct distance. Open up the whole thing and draw straight lines across where the mark is. Cut across on yourline to make a box of the correct length. Add the change in length to the back piece as well. Work out where your camera goes and make a hole for it (it use the camera to get more accurate motion tracking). Cut all that out and assemble again. This time, add velcro on the top to hold the box, and add velcro straps to the side to hold the phone from slipping out. Take the metal taped strip and install it on the left side, with about 1 cm touching the screen and the back attached somewhere you can touch it..
Notice the foil strip. It might be nice to have the touch point a little bigger, but this works fine. Put it all together and try it out! 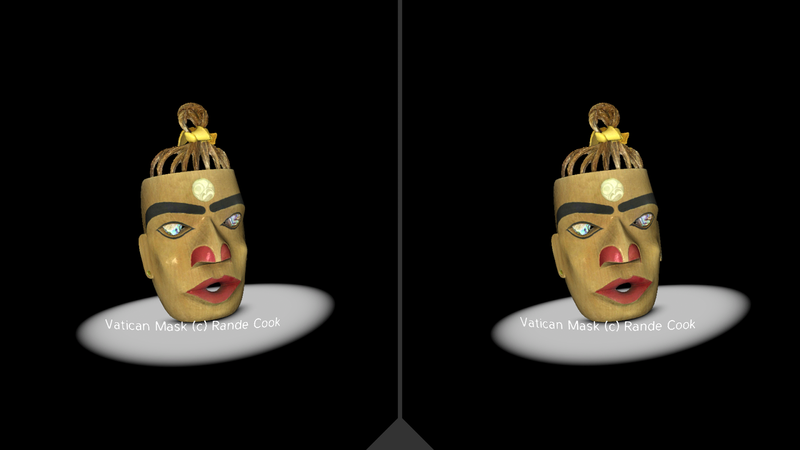 In the cardboard app, definitely the winner is the Earth app. My immediate wish was that I wanted to be able to go anywhere, not just the featured locations. It's very cool. Tap to start flying. Although the tap thing won't work, and you have to change the mode to 3d after you start each video, some of these are very cool. It's definitely worth trying out. I feel confident saying it's no Oculus Rift, despite never having tried that. Input delay is maybe around 60ms, which is enough to make you queasy after 10 minutes or so. Of course, it cost me a total of 7$, and I think that's a good way to look at it. Maybe you should have gone to I/O after all. Where are you going to get those lenses? 40 mm focal length? How do I figure that out? Actually, you may already have them. As you may remember from setting things on fire when you were smaller, to focus the rays of the sun you need to adjust the height of the lens over the focusing surface, be it an ant or a piece of kindling. 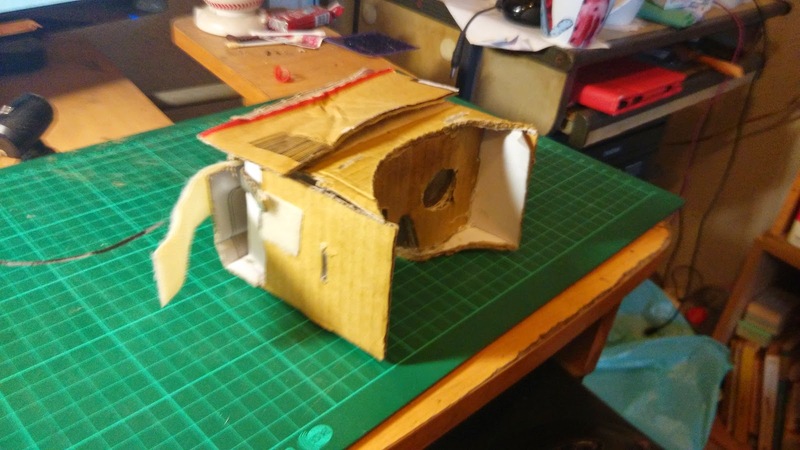 In truth you are projecting a very small image of the sun on the paper, just like Google cardboard is going to project a very small image of your smartphone screen straight into your eye. To get that focal length, just get out under the sun and measure how far over the focusing surface you have to hold the lens. That's the focal length. (simplifying slightly, but with the sun it's not too likely to matter). The lenses that Google suggests are 45 mm lenses, which is about equivalent to a magnifying glass with 5x to 7 x strength. Some of the cheap jeweler's loupes are around this strength. If you're a teacher like myself, you might be able to use the strong biology magnifying glasses, but the lens sets are likely to be useless. Alternately, you might be able to use the lenses from a pair of cheap binoculars. Mine, however, are too weak. The shorter the binoculars, the better this is likely to work. In both cases you might need to fiddle with the lenses somewhat since they are almost certainly different from the Google ones. You need to ensure that the lenses are perfectly flat with the screen so they don't project the image into the wrong place. And you need to make sure that the distance from the lens to the screen is exactly correct so they aren't projected out of focus. I'd suggest thin pieces of cardboard to lift the lens holding piece to the correct position. In addition, the Google lenses have a 2.5 cm diameter. You might be able to make other sizes work, but it might be difficult. Most of this advice comes from the Cardboard & VR Developers Google+ Community. Other key advice from them would be to change to mounting point for the magnet, as many phones mount them in different places. Finally, I have been looking on the Chinese sites, especially Taobao. This seller is offering them for about 10$ US, claiming delivery around July 6. He claims that 40mm lens diameter will offer a better field of view - of course he may just have a good source for 40mm diameter lenses.